I went back to work today after being out for four months due to back surgery. 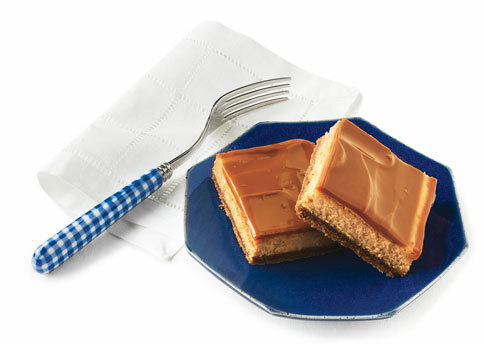 I knew I wanted to bring in a tasty treat for my co-workers, just to remind them how much they missed me 😉 I contemplated making one of my delicious cupcake recipes, but decided to take it up a notch with these cheesecake bars… and am so glad I did. They were loved by all! Coat 13x9x2-inch metal baking pan with nonstick spray. Mix graham cracker crumbs, sugar, and cinnamon in medium bowl. Add melted butter; stir until coated. Transfer crumb mixture to pan. Press evenly onto bottom of pan. Bake until crust is light golden, about 10 minutes. Blend cream cheese and sugar in bowl with mixer until smooth and creamy, about 1 minute, stopping occasionally to scrape down sides of bowl. Add eggs 1 at a time, beating 3 to 5 seconds to blend between additions. Add dulce de leche and vanilla; mix until blended, about 10 seconds. Spread batter evenly over cooled crust. Bake until just set in center and edges are puffed and slightly cracked, about 38 minutes. Transfer to rack; cool completely. Heat dulce de leche and 3 tbsp cream in microwave-safe bowl in 10-second intervals until melted. Stir to blend, adding more cream by teaspoonfuls if too thick to pour (amount of cream needed will depend on brand of dulce de leche). Pour glaze over cooled cheesecake; spread evenly. Refrigerate until chilled, about 1 hour (glaze will not be firm). Can be made 2 days ahead. Cover; chill. Cut cheesecake lengthwise into 4 strips, then crosswise into 6 strips, forming 24 bars. This entry was posted in Desserts, Recipes, Vegetarian and tagged bars, cheesecake, dessert, dulce de leche. Bookmark the permalink. Nice! NICE! May I come work where you do?